These really are the best, super moist chocolate cupcakes ever. Made from scratch with cocoa powder, they are deeply chocolatey, perfectly fluffy, and with a domed top. 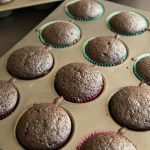 These homemade chocolate cupcakes are way better than any boxed cake mix, with the same moist crumb and texture that you know and love. Heat oven to 350 degrees. Line a cupcake pan with paper liners. Combine the flour, sugar, cocoa powder, baking powder, baking soda, and salt together in a bowl and whisk together. Combine the egg, buttermilk, oil, and vanilla in another bowl and whisk together. Add the wet ingredients to the dry ingredients and mix using a stand mixer until combined. Add the hot water to the batter and mix again, scraping the sides of the bowl as necessary, until combined. Batter will be thin. Fill cupcake liners half full, then bake for 18-21 minutes, until a toothpick comes out with only a few moist crumbs when used to test a cupcake.